Green cash mobs highlight businesses that are doing their part to be environmentally conscious. Your job is to support them by purchasing their goods & services, sending them a note of thanks and/or giving them a follow on social media. 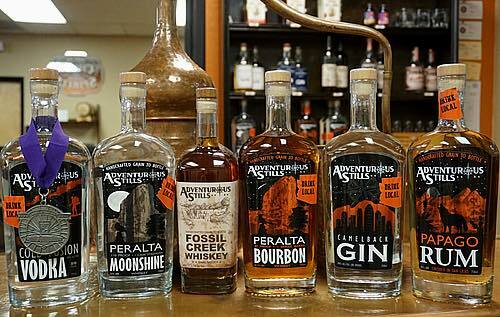 Adventurous Stills has a name that exemplifies their entrance into the art of distilling, adventurous and bold. From their humble beginning beside a backyard pool, they have created a line of whiskey, gin, rum, vodka, bourbon and moonshine that is gaining attention on the local and national craft distilling scene. What makes them extra special is their care and concern for their environmental impact. The owners are proud Arizonans who have gone on adventures throughout the state and the names of their products reflects the wild spaces we all love. They’ve built their own stills from scratch, have a grain-to-bottle mentality where they personally see their products through every stage from raw ingredient to bottling, focus on sourcing ingredients locally and regionally, opt for reusable glassware at their tasting room bar and raise up other local distillers who abide to the ethical code they created for themselves. This month, show Adventurous Stills some support with a visit to their Tempe distillery, pick up a bottle at select retail locations or order a drink made with their products at select restaurants. Their tasting room offers a bar where you can enjoy straight sips of their creations and delicious cocktails. They also give tours of the distillery with tastings of all of their products. And for those of you planning for the long term, you can even distill your own barrel which results in between 25-30 750ml bottles.